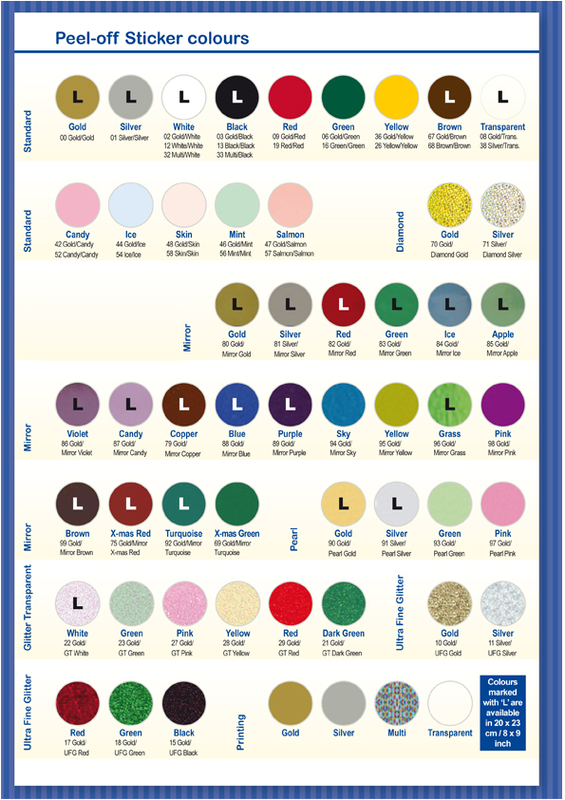 A large assortment of peel-off stickers in many colors. 10 x 23cm / 4 x 9 and 20 x 23cm / 8 x 9”. There is a variety of stickers like: outline stickers, especially for coloring in, solid stickers as decoration, stickers used for special techniques, like Jewelly and Scrapito, but of course also lots of text stickers in many languages and corners and borders stickers stickers. You name it, JEJE has it. 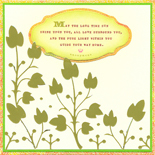 Each sticker design is available in gold, silver, pastel colors, bright colors, or special foil types. The range is regularly renewed to the customer's and consumers demand and the latest trends. Companies can create their own design or we can make it for them. If possible we carry out every sticker wish! 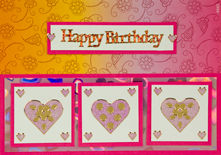 Very famous exclusive stickers ranges are Hobbydots and Hot Off The Press Dazzles. Stickers are available in many colors. Below an overview of all foils and colors. 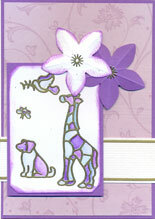 These basic foils can be combined with different imprint foils. All stickers, pearl stickers, mirror and diamond stickers come standard with gold foil print. Stickers are available with euro loch and/or barcode. On request also available with printed company name. Stickers are available in an enormously wide variety of types and sizes. 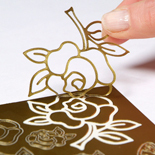 A template is used on special machines, applying a combination of heat and pressure, to create a contour in foil, resulting in a relief edge. Stickers that have been produced in this way are known under various names, such as contour stickers, outline stickers, peel-off stickers, hobby stickers etc. It is the collective name of a type of stickers that can be used for countless applications. JEJE Produkt has given different names to all the uses and applications of stickers in its collection. Below we provide a specification of the various types of stickers and how they are used. 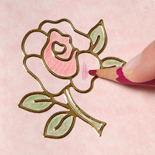 The best known stickers are the mostly gold or silver stickers that can be coloured in with felt-tip pens, coloured pencils, paint or ink. This is also the most frequently used way of working with stickers. Although gold and silver are always attractive to use, other colours are also very nice, as shown by the various examples of colours and foil on this site. They are often beautifully shaped stickers for certain applications. 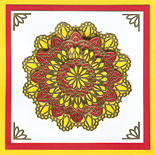 For example, you may embroider them or use them as a background for a 3D picture or simply as decoration of a card or object. 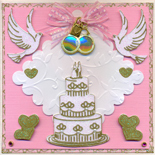 Mostly these stickers are made in a special foil, such as Glitter Foil, Diamond Foil, Pearl Foil or Mirror Foil. 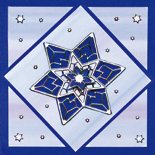 The 3D ornament stickers consist three different series. The first series consists of mainly classical designs, the second of more modern designs and the third of smaller models. 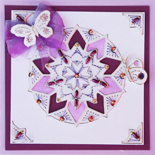 All 3D ornament stickers are very attractive not only on cards but certainly also on decorations. The series are available in sets (with ten different sticker sheets) or as loose sticker sheets in four colour versions: gold / silver / assortment of pastel shades / assortment of dark (Christmas) shades. Instructions: Take a 3D sticker sheet and paper of two or more different colours. Put the largest sticker motif on paper of one colour and the next size of sticker on paper of another colour. Go on until you have used the smallest sticker motif. Cut them out and put them one on top of the other using 3D foam dots. 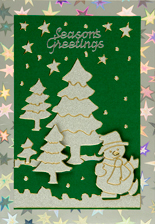 Then, stick the whole ornament on a card, box or another object using double-sided adhesive foil. Home Decoration is the Trend today. 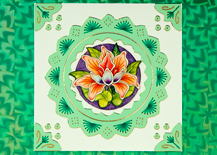 The motifs of the Home Deco stickers are larger and designed to enable you to decorate a tray, box, frame or scrapbook quite easily. You can put them onto practically any object in the home. Even one single sticker makes a cup look gorgeous. Home Deco Stickers have a strong adhesive layer that is dishwashing-proof. 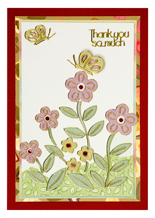 In addition to decorating objects, these attractive stickers can also be used for making trendy greetings cards. Fancy-work is the English term for 'fancy handiwork' and that is exactly what is created by means of these stickers quite easily. 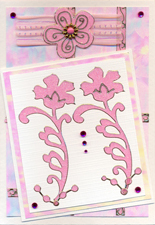 Fancy-work stickers have beautiful dot patterns that can be used as a basis for embroidering on paper. 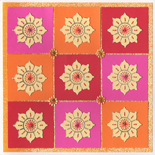 Each design has been made to ensure that the straight stitch will take you a long way. 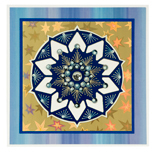 Combined with sewing on beads and/or spangles, each sticker provides a fantastic result. Fancy-work stickers are available in sets (of ten sticker sheets) or as loose sticker sheets. 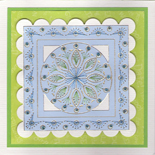 There are three sets: Fancy-work everyday with general motifs in the trendy colours candy, cream, ice, mint, violet and transparent, Fancy-work Christmas with motifs for Christmas in the colours white, blue, green, gold, transparent and red and Fancy-work butterflies and flowers. 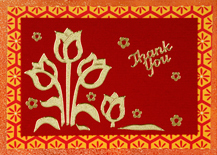 Put the sticker on a card or a piece of paper and put that on a pricking mat. Prick through the dots on the sticker. 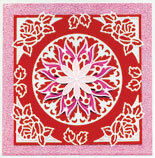 Embroider the sticker with one strand of DMC stranded cotton and/or with beads and spangles. Click here for instructions. Use a thin needle for embroidering as you can prick it through the holes easily and during embroidering you can also sew on beads without having to change needles. Fasting on and off thread: thread a needle, prick through the first hole from back to front and stick the beginning of the thread onto the back of the paper using a piece of adhesive tape. Stick the end of the thread also onto the back using a piece of adhesive tape. 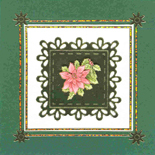 Embroidery stitches: the patterns on a Fancy-work sticker have been made to ensure that the stem stitch or the straight stitch will take you a long way. 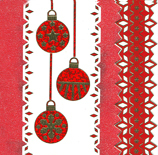 Combined with sewing on beads and/or spangles, even those stitches alone provide a splendid result on each sticker. Sewing on beads: prick the needle through the hole from back to front, string a bead on it and prick the needle through the same hole to the back. Go to the next hole and repeat this action. 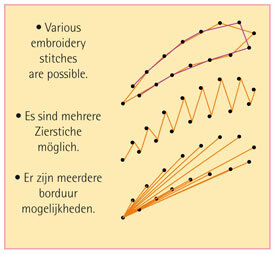 Examples of various embroidery stitches. 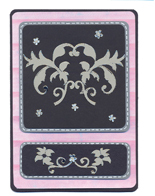 If you are in the mood for making simple cards that you want to give a sparkling and also a very smart appearance, then pearl stickers are indispensable. Pearl stickers are spectacular stickers made of softly shining glitter foil that stand out really beautifully on any type of paper. 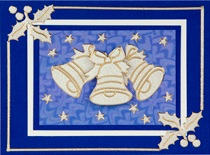 The stickers are available in two sets with five different Christmas motifs and two sets with five different general motifs. Each set consists of ten stickers, because the five motifs come in two colours, silver and gold or green and blue. 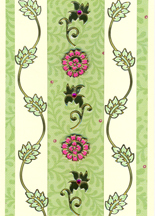 The general motifs even come in pink, green and blue. This is a stand-alone series of stickers for everyone who likes glitter and glamour. They are transparent stickers with tiny glitters in them. Available in various colours: yellow, pink, pastel blue, pastel green, Christmas red and white. The series is subdivided into sets and loose stickers that are simply called Glitter Stickers. 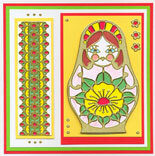 These general and Christmas motifs are mainly used on cards, but they are also very nice for decorating utensils. 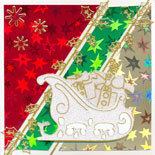 Use the Christmas Glitter Stickers for making cards or decorating, for example, the Christmas breakfast table. Your day-to-day tableware temporarily assumes an entirely new look with the new Christmas glitter stickers. These stickers are dishwashing-proof and can be removed from the plate or any other smooth surface after use. are stickers with an evenly staggering pattern in two narrow rows. They can be used for decorating cards and other objects and for making beautiful bows by gluing two ribbon stickers neatly together and shaping them into a bow. Stick the bow onto the chosen surface using a foam dot or glue drops. The small stickers left after removing the ribbon stickers may very well be used to make gorgeous backgrounds with transfer foil. 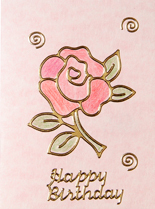 Place the tacky side of the transfer foil over the small sticker remains. Rub down hard with a flat object to ensure that all the stickers adhere to the transfer foil. Carefully remove the transfer foil with the sticker parts from the sticker sheet and stick it onto the surface chosen. Again rub the stickers and press them down firmly. Then slowly remove the transfer foil, leaving the stickers well shaped.